Michael Mitzenmacher (left) and Stuart Shieber have been named ACM Fellows, a recognition of their contributions to key computing fields. Cambridge, Mass. 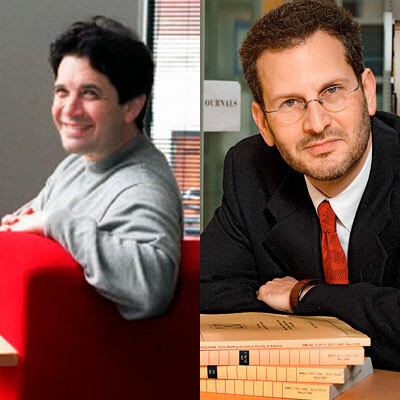 – January 14, 2015 – Michael Mitzenmacher and Stuart Shieber, faculty members at the Harvard School of Engineering and Applied Sciences (SEAS), are among 47 leading computer scientists named 2014 Fellows of the Association for Computing Machinery (ACM). The 2014 ACM Fellows have been selected by their peers on the basis of their contributions to key computing fields, including database mining and design; artificial intelligence and machine learning; cryptography and verification; Internet security and privacy; computer vision and medical imaging; electronic design automation; and human-computer interaction. Mitzenmacher, the Thomas J. Watson, Sr. Professor of Computer Science at Harvard SEAS, was cited for his contributions to coding theory, hashing algorithms and data structures, and networking algorithms. His research focuses on developing randomized algorithms and analyzing random processes, especially for large, distributed computer networks such as the Web. He develops mathematical tools and methods to analyze complex systems and uses them to solve problems that arise in real applications. For example, his work has improved methods for IP routing and distributing bulk data (such as movies or software) over the Internet. In 1998, Mitzenmacher helped create new classes of erasure and error-correcting codes, research which earned him the ACM SIGCOMM Test of Time award in 2009. He also co-developed the theory of min-wise independence, which provides a mathematical framework for finding syntactically similar documents in a large collection. The theory was originally applied in search engines to avoid storing multiple approximate copies of a document, reducing storage needs by about 30%. A 1991 graduate of Harvard College, Mitzenmacher received the Certificate of Advanced Study in mathematics from Cambridge University in 1992 and a Ph.D. in computer science from the University of California, Berkeley, in 1996. Shieber, the James O. Welch, Jr. and Virginia B. Welch Professor of Computer Science at Harvard SEAS, was cited for his contributions to natural-language processing, and to open-access systems and policy. Shieber's primary research area is computational linguistics, the study of natural language from the standpoint of computer science. Research in this field pursues both scientific and engineering goals, undergirded by foundational formal and mathematical tools. Addressing all of these aspects, Shieber's work has advanced the mathematical foundations for language processing tasks such as natural-language question answering and machine translation, and has provided new methods and algorithms for solving such problems as well. His wide-ranging research crosses into linguistics, theoretical computer science, philosophy, psychology, and artificial intelligence. As Faculty Director of Harvard's Office for Scholarly Communication, Shieber has also led Harvard’s efforts to institute open-access policies that are now emulated elsewhere. He was the founding director of the Center for Research on Computation and Society and is a co-director of the Berkman Center for Internet and Society. A 1981 graduate of Harvard College, Shieber earned his Ph.D. at Stanford University in 1989. ACM will formally recognize the 2014 Fellows at its annual Awards Banquet in June in San Francisco. Additional information about the ACM 2014 Fellows, as well as previous ACM Fellows and award winners, is available on the ACM Awards site.